Where Did All the Hardware Stores Go? Is this the beginning of the end of the local hardware store? Have you ever gone into a local hardware store, stepped through the doors and thought, “Is this heaven?” I have. Murphy’s QP store in Lincoln, Nebraska. The “Q” and the “P”? Why, quality and price, of course! For those of you who might be in the neighborhood, don’t go running to your car just yet, because after nearly 60 years in business, the QP has closed. I don’t even live in Nebraska and I was saddened. It was like the death of a beloved friend that I always visited every time I was in town. RIP, QP. I loved you. What made the QP special? You always knew that when you walked in the door that you would be immediately greeted by someone with a friendly, “Whaddya need today?” and you knew without a doubt, that whatever bit or bob you were about to say, THEY HAD IT. They may have had only one; it may have been covered in dust; BUT. THEY. HAD. IT. The best part? As soon as you asked for that Whatchamacallit for your sink that was last manufactured in 1962 that friendly person turned around and, with the veracity of a bloodhound, led you directly to that Whatchamacallit. Okay, maybe that wasn’t the BEST part, because the true BEST part might have been that when you got to the register you didn’t have to pay an arm and a leg and your first born child to take the Whatchamacallit home with you. I could wander the QP for hours. They always had something to take home that I didn’t ever know that I needed. Please do not think that I am diminishing the need for the big-box store. I certainly am not; they, too, have their time and place. Like, say, 9:55 p.m. on a Monday night when you all of a sudden find yourself in the market for a new wax ring for the toilet that your 7-year-old was standing on and managed to dislodge from the floor when the old rusty flange bolts gave way. (Not that I’m speaking from personal experience or anything.) They’re also great for general day-to-day things. I will freely admit that I think I know the floor layout of my local big-box as well or better than the greeter that they have at the front entrance. But that doesn’t mean that I don’t love my local stores as much or more. My local hardware store may have more limited hours, they might not have fancy websites, and they don’t have fancy self-check-out stations, but they are worth their weight in gold as far as I am concerned. My local hardware store is Southside Hardware right here in Saint Louis. South City, if you want to be exact. Run by the same family….since forever, they are a friendly sight each time I walk in the door. Now, if personal interaction with living, breathing human beings isn’t your thing, then perhaps local hardware stores just aren’t for you because the folks at Southside ARE going to talk to you, whether you want them to or not. Southside Hardware stocks just what people in the neighborhood need. A neighborhood filled with houses from the 1920’s through the 1960’s, they’ve got just about every part bound to fail on homes of that era. Just looking over their plumbing section, they’ve got one of just about everything and if they DON’T have it, they’ll order it. They can also repair windows, make new screens, tune up your lawnmower, or anything else you can imagine (that you’ll actually need). Just like those small hardware stores, Make it Mid-Century is bringing back small-batch, unique and period-appropriate products for homes of the mid-century era. Can you go to a big-box store and buy a new front door? Sure you can – if you don’t mind that it doesn’t at all match the period of your house. Just as the eyes are the window to the soul – the front door is the soul of the house. It stands out. It makes a statement! And if that statement is, “I bought this at the big-box store and it’s the exact same door as half of the neighborhood” then perhaps your home’s soul needs a tune-up. Now, where was I? Ah, yes, I’ve already mentioned the late QP and my still burgeoning Southside Hardware, but a third hardware store that makes my socks go up and down is Strasser Hardware in Kansas City, Missouri. Strasser’s is actually quite updated on the inside, but don’t let that bright and clean atmosphere surprise you – they, too, have oodles of Whatchamacallits and Thingamabobs just waiting to be purchased. What are your favorites? I’d love to hear about them. 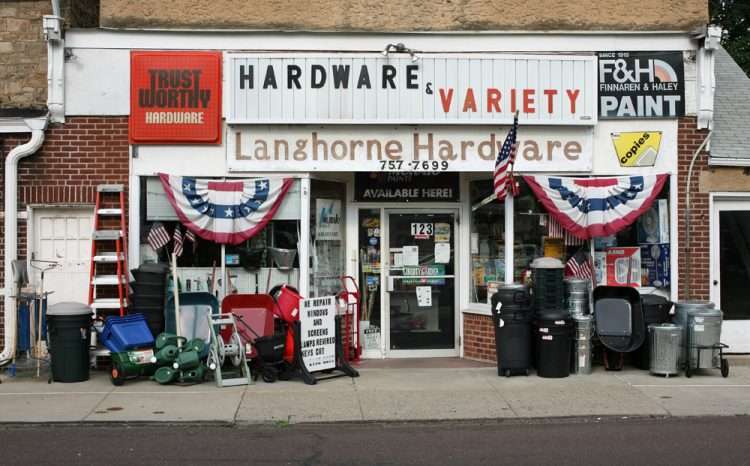 Where is your favorite local hardware store and what makes it special? I’ll add it to a list on the website as it expands – because surely you’d rather share your secret hardware crush than see it go under? Let’s recognize the best of the best all over, not only by naming names but by shopping there as well. Vote with your feet and your money. Save your small business and tell them “hello” from me when you’re there.